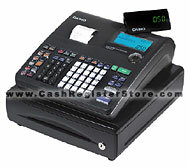 Casio PCR-T470 Electronic Cash Registers at Cash Register Store. The newly released Casio PCR-T470 electronic cash register comes packed with many features and a new piece of innovated technology. Casio is the first to manufacture cash registers with anti-microbial (anti-bacterial) technology. Why are anti-microbial keyboards a great benefit? Simply because hands and fingers are a common way of transmitting harmful bacteria and diseases and because many different people touch a cash register keyboard every day, this technology is perfect to aid in the control of reducing the spread of disease and sickness in the workplace resulting in fewer sick days. To read more about this new anti-microbial technology, click here. Being of a small footprint and low weight, the PCR-T470 is perfect for a kiosk or as a starter cash register. This cash register comes with a stylish black design and features a 3 line emerald LCD display, high speed thermal printer, 25 one touch department keys, 2000 plu's and a small compact cash drawer with a media slot. An optional flash memory device is available to save a secure program back-up, and use the device to download the same program to multiple units. This saves huge amounts of time on not needing to individually program multiple cash registers. This register has an automatic voltage detection feature. It detects the type of electrical current incoming and makes the adjustment so as not to overload the cash register. It does not matter whether you have 110 or 220 volt power, it will not harm the register. This is a great feature if you want to operate this cash register in countries outside the USA.